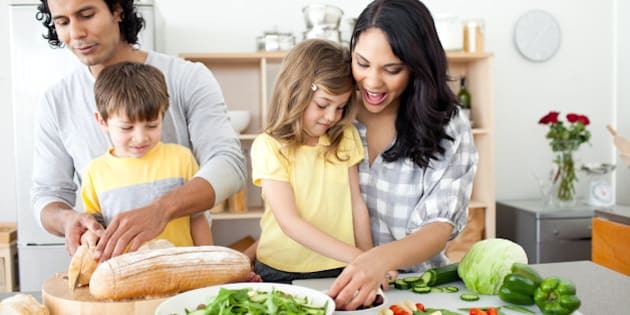 Having fun in the kitchen is a good way to start your kids onto the path of loving food and cooking. Knowing how to cook and what to choose at the grocery store is valuable life skill that can be very rewarding. It starts at the grocery store. Yes, it can be hard to pack them up and take them to the store (especially when you have three of them arguing about who goes into the cart and who pushes), but trust us, it gets better. Point out the colours of the rainbow in the produce aisle and show your little ones the varieties of fish at counter. Maybe even let your child pick out the (healthy) yogurt they'd like to try, all the while giving them tips and fun facts about the products. And if you don't know everything about every food in the store that's okay too, it's just another reason to put it in your cart — you can learn more about it and give it a try. Take an afternoon to just have fun and fool around a bit in the kitchen. Inviting kids in the kitchen usually brings curiosity with them and hopefully will intrigue their palates and inspire them to taste their creations. It doesn't always work that way (I know from experience) but there have been times when I'm sure the kids will eat something simply because they helped make it.